Jan Stevens recently visited the Extreme Medicine Conference held at the Royal Society of Medicine and wrote the following article in Dutch. For those of you who read Dutch – enjoy! Expedition & Wilderness Medicine is the leading provider of expedition, wilderness and remote medicine training courses, conferences and EXPO’s for medical professionals. We combine decades of experience with passion, enthusiasm and hands-on practical knowledge. Over the past couple of years we have been pretty busy establishing new courses and the Extreme Medicine Conference and we have some ideas bubbling on the EWM cooker but we would love to get your input into what you would like to see us developing. You can influence us either by emailing our Managing Director Mark Hannaford directly at mark@expeditionmedicine.co.uk and also by pre-registering your interest for the differant concepts below. It’s great to be part of such a vibrant remote medicine community and please help us to help your more. Join Dr Luanne Freer. medical director of Yellowstone National Park and past president of the Wilderness Medical Society, and National Geographic aboard the NG Endeavour in a voyage of exploration following in Darwin’s footsteps through the Galapagos exploring one of the world’s most unique ecosystems supported by five onboard naturalists. To make the most of your 10-day Galapagos cruise, there are plenty of choices, including some shore landings before breakfast and long hikes, short hikes or coastal explorations from Zodiacs and kayaks. Go deep water snorkelling in the wetsuit and snorkelling gear provided by the ship – which are yours for the entire expedition. Dr Freer will be presenting a series of CME accredited talks focused on aspects of wilderness and remote medicine drawing upon her many years of experience in this field. Following on from the success of the inaugural Extreme Medicine Conference held at the Royal Society of Medicine in London we are crossing the Atlantic to Boston and joining forces with Harvard Medical School to present one of the most innovative medical conferences around and ‘the’ conference on remote medicine. We are looking to launch the conference officially in September but we wanted to give you the chance to access special ‘early-bird’ discounts and secure your tickets by pre-registering. Aconcagua is the highest point on the American continent and the tallest peak in the world outside of Asia. Rising approximately 4,000 ft above its surrounding peaks, Aconcagua, “The Stone Sentinel”, dominates the rugged Andean landscape. The ascent to its summit offers spectacular views of the Andes mountain range. The accredited curriculum’s highlights include pathophysiology, treatment and prioritization of care for a variety of medical problems commonly encountered in wilderness environments and settings remote from hospital/ definitive care. Physicians and allied health care providers who counsel patients travelling to remote areas will be interested in the topics covered during this unique CME event. The curriculum includes altitude safety, altitude risk reduction, recent recommendations on altitude-related illnesses prophylaxis, rescue strategies and ethics, as well as real Everest war stories- uncovering what it really takes to deliver health care in the high mountain environment. This will be achieved through didactic lectures, small-group discussions and hands-on training. Following the Horcones Glacier, we’ll attempt the summit on the northeast aspect of the mountain. A return of an old favourite. We are looking into the possibility of returning to the iconic Maldives, a centre of world diving, to run a highly rated Diving Medicine Course. This is 6 day course aims to give participants an understanding of conditions likely to occur whilst working as a doctor on a diving or marine-based expedition. Topics covered will include pre-expedition medicals, diving-related illness, marine envenomation, emergency treatments and casevac plans. Practical sessions include boat handling, search & rescue and underwater communications. There will be at least 2 dives a day, including a night dive and hopefully a visit to the hyperbaric chamber on Kuramathi Island – the largest facility in the Maldives. 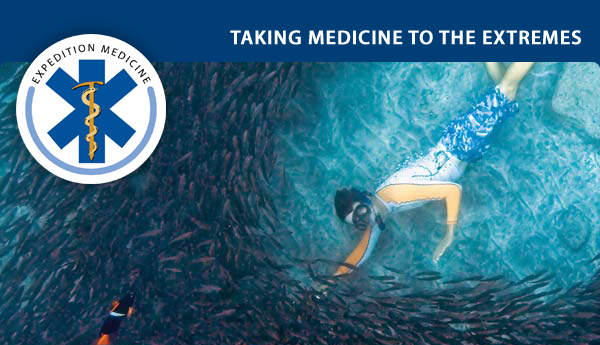 At the end of the week, participants should feel confident to act as medical officer on a diving expedition, or in any UK diving medical practice. An PADI Advanced Openwater diving certification, or equivalent is required. As I roll over in a tangle of sleeping bag, clothes and thermarest, cocooned by the sides of my hammock, I find that my mouth is dry with the bitter taste of permethrin. Apparently I spent some of the night sucking my mosquito net. This actually comes as a relief because at least I slept rather than lying awake in rigid fear of my hammock poles snapping. Again. I lie there in my post-sleep daze, slowly becoming aware of the increasing animal calls which surround me, waking me from that lovely slumber. I allow the sounds to wash over me for a while before opening my eyes to see the dense jungle emerging with the light of a new day. After following a complicated procedure to get dressed and exit my hammock, which resembles a badly choreographed gymnastics routine, I make my way over to the fire pit. Any of the team who have failed to be woken by the increasingly angry cicadas, are now summoned from their dreams by my efforts at splitting wood with a less-than-sharp machete. However, I eventually manage to light a carefully crafted wood pile and proudly watch as it roars into life. Whilst the water is heating above it for another morning of porridge and 2-in-1 coffee, I find myself staring into the dancing flames and considering my situation. I’m six days into a twelve day trek, deep in the jungle somewhere in Borneo. I am solely responsible for the health of my intrepid band of ten expeditioners using a limited medical kit and only my clinical cunning to make up for its shortfalls. To cap it all, my casevac plan states that the time to get a patient to anything vaguely resembling a hospital may be up to 24hours. A fairly normal question at this point may be, what am I doing here? A few years ago, after doing some work as a remote care paramedic supporting extreme sports events, I decided it was time to take my interest in wilderness medicine further. So it was that I enrolled on the Expedition and Wilderness Medicine course. As anyone who has attended this course will know, I left with new skills, better knowledge of this speciality and a great deal of inspiration. An unexpected bonus of attending the course was the highly approachable and experienced faculty, of whom I took maximum advantage to glean all the information I could. A well-trodden path at the beginning of one’s expedition medicine career appeared to be working for Raleigh International. So, after an application form, a selection weekend and a pre-deployment training weekend I found myself on the plane to Borneo clutching my very shiny, very new copy of the Oxford Handbook of Expedition and Wilderness Medicine. Working for Raleigh, purely from the medical perspective, was a varied and stimulating experience. Initially, in the pre-expedition phase, the focus was on preparation of equipment and staff. The medical team are responsible for evaluating the drugs and equipment, preparing the medical kits and training non-medical staff in first aid and health and hygiene. We also carried out site visits to review casualty evacuation plans and to assess the facilities of local hospitals and health clinics. Once the venturers arrived we ran training sessions with them emphasising preventative healthcare, such as hand washing and monitoring their fluid intake, but also empowered them to care for minor wounds and illness. The medics also carried out medical one-to-ones with each of the members of the expedition team to ensure vaccinations were current and a sufficient supply of personal medications had been packed as necessary. Once the expedition began and we were deployed into the jungle, each smaller team of approximately ten people had one medic embedded in it. This role was very autonomous and how each medic ran their medical care was on an individual basis. Personally, I was very vocal on public health issues, the most contentious of which, particularly with some male members of the group, was ensuring regular bathing. I found this hands-on approach to be very effective when done tactfully and as a result I had to deal with very few preventable conditions. I also ran informal foot clinics each day, checking the teams’ feet during rest stops to check for maceration, blisters or leech bites. Another area that I was aggressive with was wound care, with even the smallest of scratches being immediately cleaned and treated with iodine. However, it is not all plain sailing and with expedition medicine you have to be psychologically and clinically ready to deal with a serious condition in some very challenging environments. This was demonstrated one day when, five hours into a seven hour jungle trek, and several hours from the nearest road, I turned around to see one of my group plunge head first down a five foot drop and then tumble a further twenty feet down a landslide path. After assessment she was found to be miraculously relatively uninjured with conditions eminently treatable in the field. However, your clinical assessment and decision making skills are certainly tested during these times, particularly when the welfare of the rest of the team needs to be considered. If someone requires evacuation it may mean a stretcher carry for several hours, potentially risking injury to other members of the already tired team. Other questions could be raised which, as the medic, people look to you to answer. Should we make camp now and evacuate in the morning? What kit should you take with you on the evacuation? Is there a water source on the evacuation route where we can purify drinking water? Would it be quicker to go to the road or the helicopter landing site? To feel more prepared to answer these questions and for a role as an expedition medic, the Expedition and Wilderness Medicine course is a sensible starting point. Whilst you cannot expect to leave as an expert on all the subjects, the benefit of having some knowledge and experience on the topics covered, prior to having to implement them in the field, cannot be underestimated. I found many of the lectures and skills stations to be pertinent to my role, from radio protocols to water purification, tropical medicine to group dynamics. The course content is very well thought out and is delivered by experts who have been there and done it. To take your interest in expedition medicine further, the combination of attending the course and obtaining a role on a large, well established expedition such as Raleigh, seems to offer an ideal combination. Raleigh, and other organisations like them, provide an excellent starting point for expedition medics for several reasons. They employ doctors, nurses and paramedics and have expeditions leaving three times a year to three different locations, so there are plenty of opportunities to gain a position with them. The benefit of working for a large and well established organisation is that often the infrastructure of the trip is already in place. Rather than establishing everything from scratch, the medic can review and adapt current policies and procedures, which provides a fantastic opportunity to use new expedition knowledge but in a less stressful setting. A large expedition may also offer the support of a “Fieldbase Medic” who is located at the expedition’s headquarters and can offer advice over the radio or satellite phone. This provides reassurance for the medic in the remote site but also gives the HQ based medic an opportunity to develop their telemedicine skills. Raleigh is also non-discriminatory when it comes to allocation of roles. Whether a doctor, nurse or paramedic, each is a Medic and has the same capabilities as one another. As part of this ethos, the expedition medical team adapts a pre-existing prescribing protocol which covers all the medicines in the medical kits. All members of the team agree on and sign this protocol, allowing all grades of the medical team to prescribe the named medications within the scope of the procedures. This provides an excellent learning opportunity for nurses and paramedics who may not have been exposed to these drugs previously. Away from the medicine, there are many other positives to working on an expedition. I had the chance to live and work in primary protected rainforest in which researchers wait years to gain a permit to enter. I had numerous wildlife encounters including orang-utans, monkeys, snakes and rare birdlife. I saw more stars than I knew existed and saw waterfalls that few have laid eyes on. During the community projects there was the chance to interact with welcoming locals from remote villages, teaching in their kindergartens, learning their culture, playing football with the young boys and one group even attended a wedding. Depending on whom you work for, the emphasis of the expedition may vary. Raleigh is a youth development charity and to see the young people changing throughout the expedition was massively rewarding. On a personal level we left with a multitude of new skills both through formal training and experiential learning. This included practical tasks such as fire lighting, building a basha and numerous general skills required to live successfully in the jungle. Interpersonal skills like conflict resolution, facilitating discussions and providing structured feedback were learned through classroom time and implementation with the venturers. It’s not all serious though and you will leave an expedition with many amusing stories, such as the night I leapt out of my hammock, wearing only my pants, to chase a bearded pig into the jungle who was running off with a box of our food in his mouth! Working on an expedition is a multi-dimensional experience with many benefits and to try and report everything here would not do it justice. I cannot recommend working on an expedition highly enough as the time I had was fascinating, scary, breath-taking, funny, beautiful and individual. However, don’t rock up on expedition with your chest puffed out and head held high because you’re the medic. The most important factor to remember is that you are part of the expedition team first and a medic second; so don’t be surprised to be digging long drops and burning used toilet paper or washing up that night or sleeping in the worst hammock spot because you allowed the rest of the team to choose their sites first. It’s all just part of the fun. With speakers such as Mike Grocott, Gordon Giesbrecht, Kevin Fong to name but a few it was hard to go wrong but the sense of energy and purposed that filled the RSM was inspirational and building bridges between the various disciplines and areas of expertise created a clear sense of synergy. We will be uploading videos of each of the lectures to a ‘members only’ area as soon as these are available for streaming. and you will be able to stream individual lectures and gain CME points – we will let you know as soon as this is all online. Wild Medicine in the beautiful country of Namibia We are partnering with Dr Rudie van Vuuren and his team to bring you a very exciting opportunity to be in close proximity to the beautiful local wildlife at the sanctuary. We will be based at the stunning N/a’an ku sê Lodge so don’t expect that you’ll be roughing it too much. The main objective of the course is to educate you as to how we can integrate the diagnostic and problem solving skills of both human and animal health professionals with the knowledge of conservation professionals. There is the opportunity as an optional extra to join Dr van Vuuren aerial tracking over Namibia amazing Namib Desert. Our Desert Wilderness Medicine is based in Damaraland, an area bounded to the south by the spectacular Namib Desert, to the east by the Kalahari, Ovamboland to the North and the world famous Skeleton Coast to the west. Our training area is a stunning region close to the Doros Crater, remote from civilisation, inhabited by an array of desert-adapted flora and fauna and with some of the most remarkable night skies in the world. Another highly successful course has just returned from Nepal after being lead up to Everest Base Camp by Dr’s Luanne Freer, Martin Rhodes and John Apps and featuring a visit from Paul Auerbach. How would you like to discover the excitement of Arctic Norway? BSES requires an xperienced medic needed for Northern Norway adventure July-August 2012.For further details of this and other great expeditions run by this well-respected youth development organisation please see www.bses.org.uk. EWM announced the winners of the EWM Remote Medicine Awards at their Extreme Medicine Conference at the Royal Society of Medicine on 17th April. The intention of the Remote Medicine Awards awards is to keep all everyone in the industry motivated, and they are dedicated to everyone involved in extreme medicine no matter how great or small their involvement, they recognize the achievements of some of the most inspiring personalities and companies that are associated, in one form or another, in the growth of the Remote Medicine industry. It was awarded for their work facilitating the safe treatment, education and empowerment of mountain porters and their communities through appropriate programmes, with priority given to creating change within the trekking industry. “The awards are a great honour, they have not only raised the profile of Porter’s Progress but the publicity has bought us new assets” Denise Prior – Porter’s Progress UK.